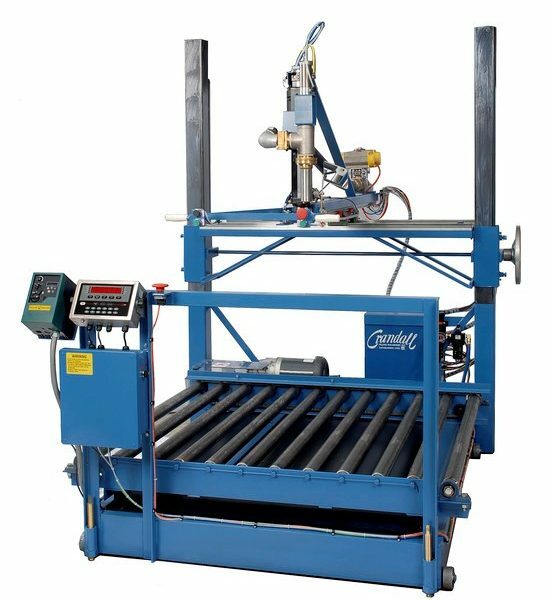 Crandall Filling – Model ET1/4X, Top Fill, Electronic, Drum Pallet Filler | PMR Packaging Inc. 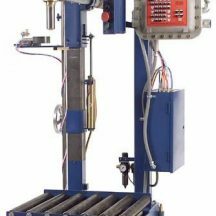 The Crandall Model ET1/4X Top Fill Electronic Drum Filling Machine is a net weight filler that will fill 4 drums on a pallet. It will fill any non-foaming food, petroleum or chemical product which will flow, settle out in the container and does not contain hard solids. For foaming products, see model EF1/4X Drum Filler. The operator places all bung openings toward the center of the pallet with the drum caps removed, and rolls pallet onto the filling platform. The operator presses the break release button allowing movement of the filling head and aligns the filling lance to the drum opening (the machine is also equipped with a mirror to aid in alignment). He then presses the start buttons. The machine will auto tare the scale and the filling lance will descend a few inches inside the drum. The fill lance will open and fill at a rapid rate until the scale reaches set-point #1 (dribble flow). The fill rate will now be in the dribble mode (slow) until the scale reaches set-point #2 (shut off), at which the fill lance will shut and then rise out of the drum. Once the fill head has reached the top of its stroke, the drip pan will extended to beneath the fill lance to capture any drips from the outside of the fill lance. The operator will move to the next drum and repeat the process until all drums are full. 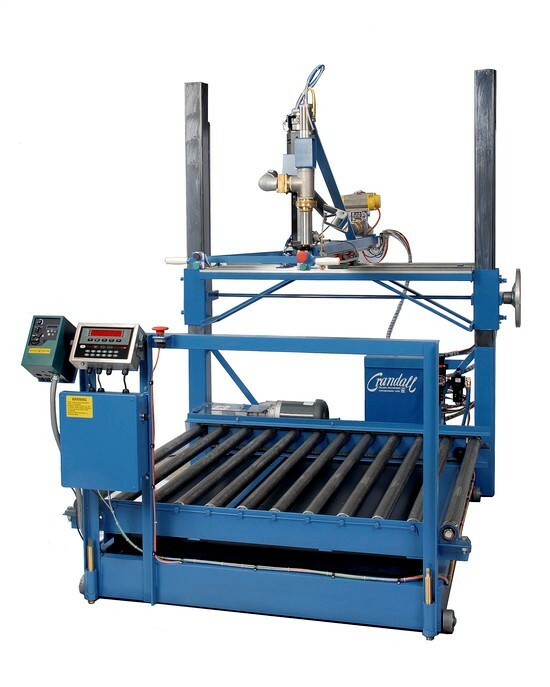 Caption: Watch the ET1/4X Drum Pallet Filler.